West Des Moines, Iowa is a city that sits in three of Iowa’s counties Polk, Warren and Dallas. In it’s early years it was a trading point called Valley Junction that was founded in 1893. It was home to Chicago, Rock Island, And Pacific railroads switching facilities and repair shops. It became West Des Moines in 1938 but Valley Junction still remains as a historical part of West Des Moines. To learn more about the city of West Des Moines. The photo above shows a Bathroom remodel project that Compassion Builders completed in West Des Moines. The old cast iron tub was removed and a new tub shower was installed in a new location. 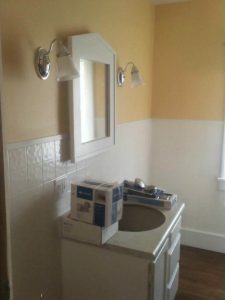 The toilet was relocated to allow for greater privacy in a one-bathroom home and the sink remained in the same location. To save money, this client elected to use a tile patterned paneling to cover up the previous damaged wall surface and give it a clean look. The vanity was reused but with new fixtures. We refinished the hardwood floor with a dark stain and a bright yellow on the walls. She was adamant on keeping the medicine cabinet since she enjoyed the shape. The mirrors edges had seen better days so we crafted a frame to mimic the trim details throughout the house. This client was elated at the transformation and spaciousness of her newly remodeled bathroom. She loved the solutions and attention to detail that compassion builders provided her on her West Des Moines home. Are you looking to Build a Custom Home, finish your basement or Remodel any part of your home, let Compassion Builders become your contractor of choice.